In recent years the kitchen has truly become the heart of the home. It’s the place you entertain, the place you pass down family traditions, the place your kids do homework and the place you welcome each new day with your favorite cup of joe. It’s easy to see how your kitchen bar-stools have become the second sofa in the home. If you are in the market for some new bar-stools there are a lot of styles, colors and sizes. Where to start can be a bit overwhelming so start with the easy step—sizing. What height stool you need depends on what height your counter is. The most common kitchen island height stands between 35” and 36” high. This would require a stool with a seat height of 24” to 26” to allow for a comfortable sit and give your knees clearance under the counter. If this is the size you need look for stools labelled as counter height. If your island has a step up counter measuring 40” to 42” high you will require a 28” to 30” stool. Look for stools labelled as bar height. On occasion you may need a lower stool for an area such as a built in desk or a vanity. Counters measuring 28” to 30” high require a standard dining chair height with a seat height of 17” to 18”. Another option, though seldom used, is spectator height stools. If your counter measures between 45” to 48” high you will need a stool with a seat height between 33” to 34”. 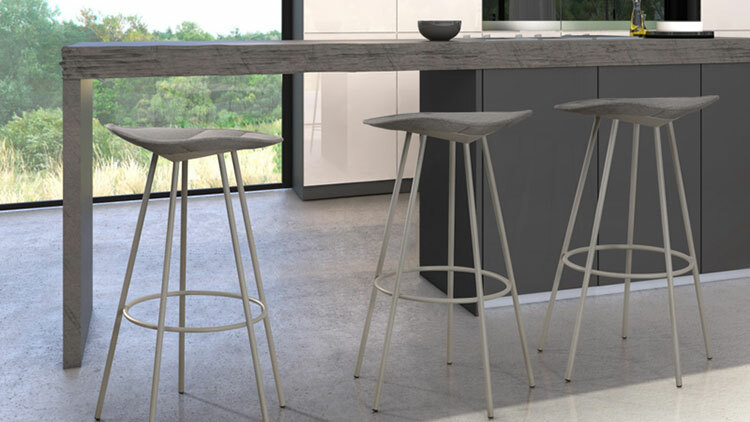 After you’ve decided on your stools height you might be asking how many stools do I need? Simple, allow 21” to 25” in width per stool for the length of your counter. Keep in mind that a swivel stool with arms often requires more space.